Reverend Parasol pays a visit to see Dragon in prison where the two of them discuss the Church of Savage Dragon. The fact that this church was formed based upon a chapter in Dragon’s autobiography does not sit at all well with the incarcerated hero. Reverend Parasol believes that the supposed dream of Dragon that featured God is a powerful one. It inspires people to believe in their own personal afterlife, something that is of great appeal to millions of people around the world. Dragon demands that Reverend Parasol remove his name from his church but this request is ignored. 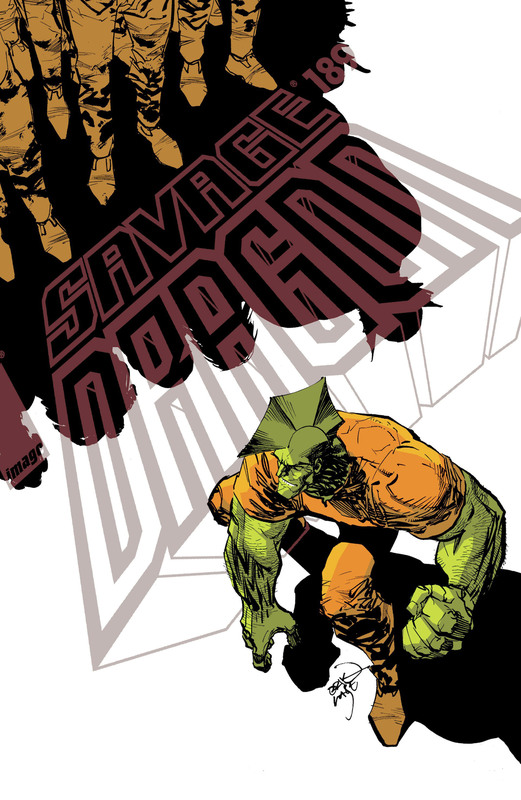 The Church of Savage Dragon is allowing Dragon to still save countless lives even though he remains imprisoned. Malcolm Dragon stops by the grocery store where Frank Darling has been working to make ends meet ever since he moved out. Times have been tough for Frank since he married Tierra Jones and he has all but written off having the life for himself that he desired, giving up on his dream to follow in his father’s footsteps of joining the Chicago Police Department. Malcolm admires his desire to prove himself as a man but points out that Mildred Darling would happily have them all move back in with her. Malcolm then gives some cash to Frank in the hopes of helping him out before heading off. At the apartment of the supposed Jennifer Dragon, Bloop begins to question the validity of her claims to be the sister of both Animal and he. The fact that Jennifer seems to have another son that has never been mentioned in the media before and that Dragon believes her to be dead leads Bloop to suspect that something is not quite right. He has arranged for Battle Axe to stop by as it is her son that is the likely identity of Jennifer’s child. Unfortunately, the villainess is in no mood to talk. Battle Axe launches an assault upon Jennifer which causes her to reveal her true identity as that of the shape-shifting Mutation. Back at the prison, Ronald Winston Urass visits the cell of Dragon where he boasts about manipulating a number of recent events. He needs no suit of armor or a robot he helped built in Iraq to destroy the White House or anything else. Urass claims to have had a hand in corrupting the justice system to have Dragon convicted and sentenced to death. He will now make Dragon’s life a misery right up until he is executed. Dragon dismisses these threats and notes that he will likely be on death row for many years, even decades. He may even end up outliving Urass who is himself an old man. Mutation holds her own against Battle Axe but another person reveals their presence as Negate becomes involved. He makes contact with Mutation who reverts back to not one but two ordinary women: Gertie Funt and Helen Black. Gertie pleads with Battle Axe not to take Battle Dragon away from her as he is all that she has. This claim enrages the alien villainess who promptly slices Gertie in half with her bladed gauntlets. She quickly gathers up her son and flees, leaving a frightened Helen Black to explain the origins of Mutation. Both she and Gertie had sought out the Power Broker for different reasons. Gertie wanted revenge upon Dragon for Jennifer’s death but also wished to assume her life as she had always admired Jennifer. Helen simply wished to be with Dragon any way she could and figured that posing as his wife would be the easiest way. She and Gertie ended up merging but their ruse never quite worked out. Dragon is confronted on his way to the pool hall by a group of Vicious Circle members that are similarly locked up. He gets threatened but Dragon points out that he can heal from virtually any injury so if they start a fight, it will be the villains that will end up with permanent injuries or even end up dead. This time Dragon’s threats fall on deaf ears though as the super-freaks launch a frenzied assault upon him. The recently injured Thunder-Head is visited at Hillman Hospital by Malcolm who is very sorry about what happened to his half-brother. Thunder-Head instructs him not to worry about it as pretty much everything that has happened to him recently had been his fault. It had been him that got involved in a plot to resurrect his father and that ultimately brought the Claw back to life instead. It was then the Claw who crushed his back. Thunder-Head has chosen to ignore the doctors warning that he may never walk again and refuses to give up hope. Malcolm makes a promise to do whatever he can to help him out. Malcolm is soon visited by his girlfriend at home before he is about to meet her parents for the very first time. Maxine Jung Lai does not approve of his choice of outfit to wear and his general lack of concern about the affair. A call from the authorities then comes through and Malcolm has to depart, marking the fifth time that he has now ducked out of meeting her parents. The fleeing Battle Axe is confronted by Malcolm who attempts to get her to surrender before she causes any more damage to Chicago, having smashed her away across the city ever since she retrieved her son. Battle Axe pins down the young hero who resorts to shocking her with his electrical abilities. The horrified Battle Dragon is taken away by the police as he vows revenge upon Malcolm for the slaying of his mother. Animal crushes the remains of Gertie to cover up her murder before Bloop announces that the life of a supervillain is simply not for him anymore. He suggests to Helen Black to leave and asks Negate to leave too but not before he does him a favor. Negate is asked to use his powers on both Bloop and Animal so that they can finally go home and return to their old lives. Dragon does his best at fending off a seemingly endless number of Vicious Circle inmates before he is finally pinned down by Gem-Head. He proceeds to pummel the hero whilst mocking him about being too old and weak to continue to fight them. Numerous other inmates then take this opportunity to dog-pile Dragon and brutally beat him. In the aftermath, a bloodied and beaten Dragon is locked back up in his cell. Urass returns to claim that every single day of Dragon’s life will consist of similar beatings and that he will outlast Dragon yet. A loosened tooth is then spat out through Urass’s head by Dragon who then celebrates his minor victory.